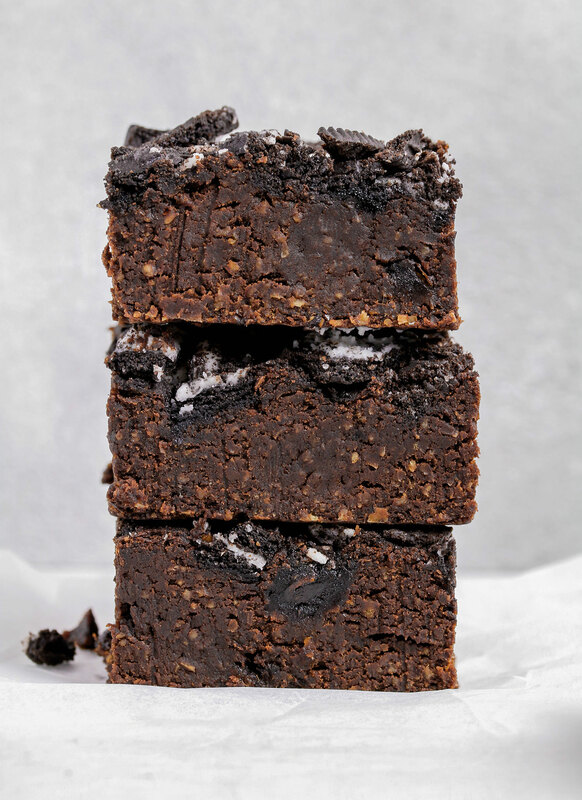 A delicious, moist and rich chocolate brownie topped with chopped Oreos. Need I say more? 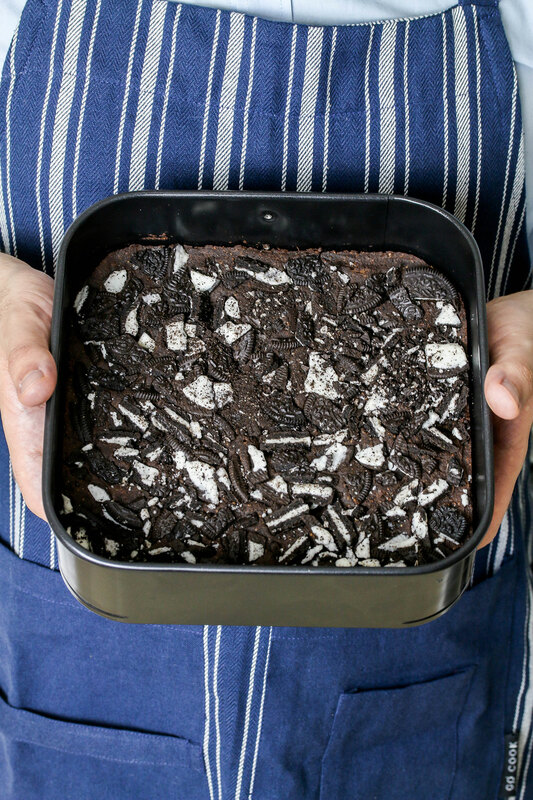 Oh, apart from they’re also healthier than your average brownies. They’re high in fibre with a hidden ingredient and sweetened with whole dates! OK, I’ll put you out of your misery. 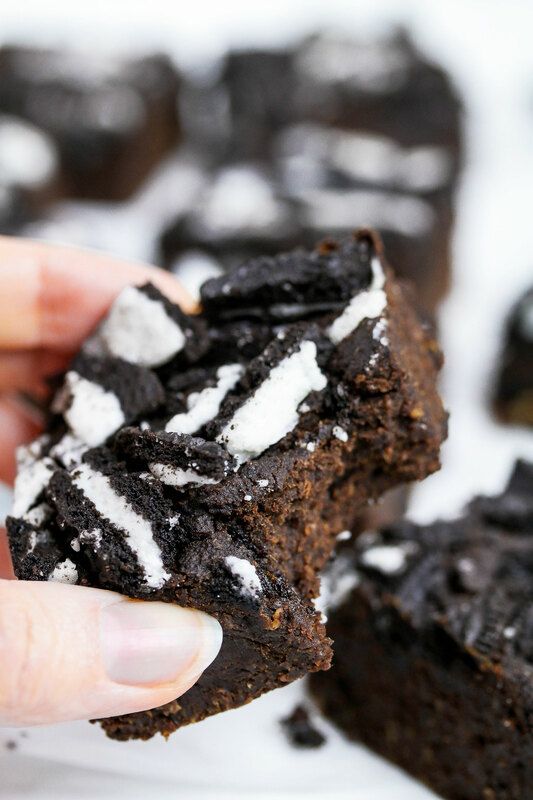 The secret ingredient in these vegan Oreo brownies is CHICKPEAS! Actually this shouldn’t come as too much of a surprise since I’ve already used chickpeas, beans and lentils before in many of my sweet treats. Tesco challenged me to nominate someone in my household who does the least cooking to create something using their new Go Cook, exclusively for Tesco products. Since it’s just me and the hubby and I do all the cooking and baking, I’m sure you can guess who I nominated for this challenge. Today, the hubby is the star of the show! I was contemplating what to challenge him to make. A main meal perhaps? Something quick and easy that won’t put him off participating? One of the reasons he doesn’t cook is because he’s always swamped with work and constantly chasing deadlines. If I wasn’t there to cook for him I can guarantee he would be eating takeaways or ready meals everyday! But I know he’s not alone. So many people struggle to find time to cook, or they do have the time but see cooking as such a big, tiring and time consuming chore, but that’s not necessarily the case. 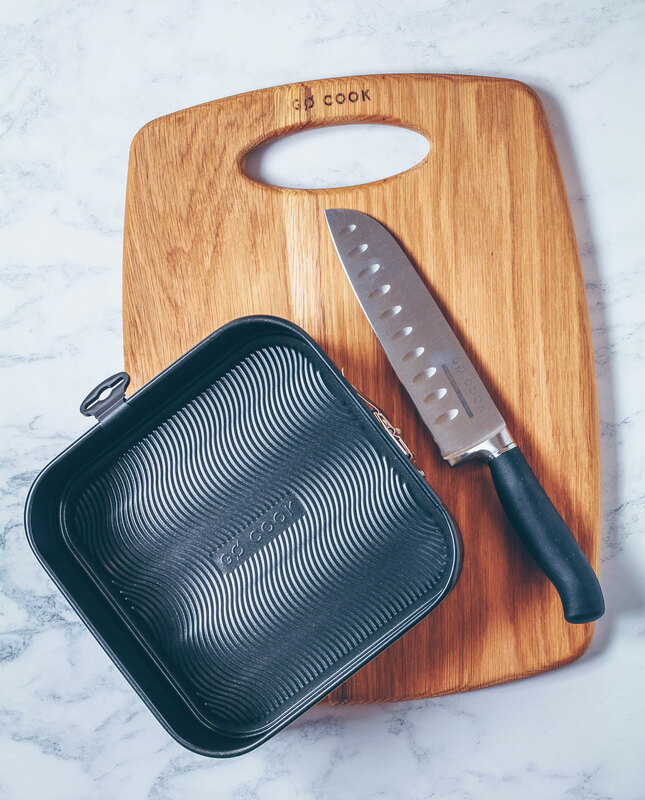 The Go Cook, exclusively for Tesco brand of premium cookware were designed to make it easier for people to cook. 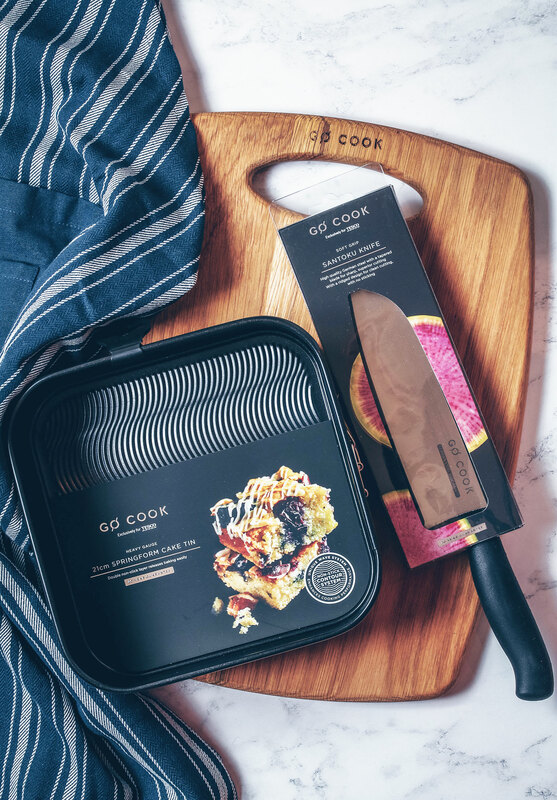 The brand includes everything from high quality pots and pans, bakeware, utensils, knives and food prep essentials so you don’t have to shop around for everything you need to cook quick and healthy meals. I decided to go with a baked treat, since the hubby has never (and I mean never!) baked anything before. Can you believe it? Unlike me, he’s more of a savoury guy and doesn’t have much of a sweet tooth, so I can see why it’s taken him this long to bake anything. However, I saw this as the perfect opportunity to get him to lose his baking virginity! 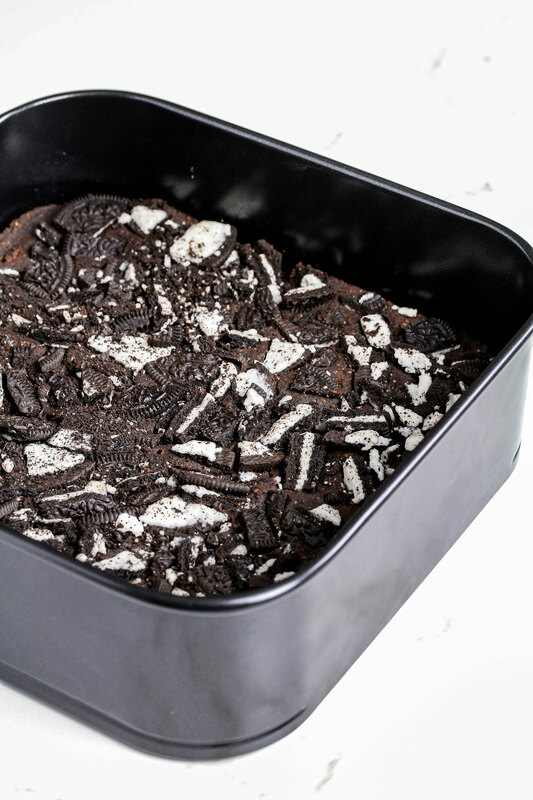 As a first time baker, he was worried about removing the brownies from the tin, but the Go Cook non-stick spring form tin we used made it so easy and straight forward! It really took out all the fuss and made the experience that much more enjoyable. This challenge has made him want to bake again! Now he knows that baking is not as daunting as he thought and it was actually fun and relaxing. I might have ignited a passion for baking he didn’t know he had! Watch this space, I might have created competition for myself! Add the dates to a food processor along with the chickpeas, coconut oil and milk and blend until you have a smooth mixture. Transfer into a large bowl, then fold in the oat flour, cocoa and salt. Mix to combine. Give the mixture a taste to make sure you’re happy with the sweetness. If it’s not sweet enough, add 2 tbsp stevia or your granulated sweetener of choice. Transfer into a lightly oiled Tesco Go Cook 21cm spring form cake tin. Sprinkle the chopped Oreos evenly on top then press down into the batter using your hands. Thanks to Tesco for sponsoring this post. Commissioned posts is how I’m able to continue working on the blog and creating recipes and recipe videos for you. As always, all opinions are my own. I love that chickpea chocolate batter! 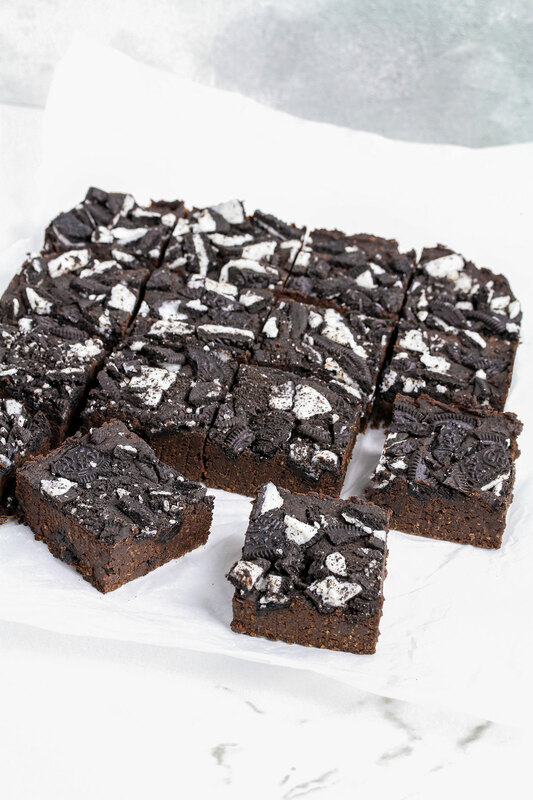 These brownies look divine Nadia! And I love the fact you’ve used chickpeas in this recipe! These. Look. PERFECT! 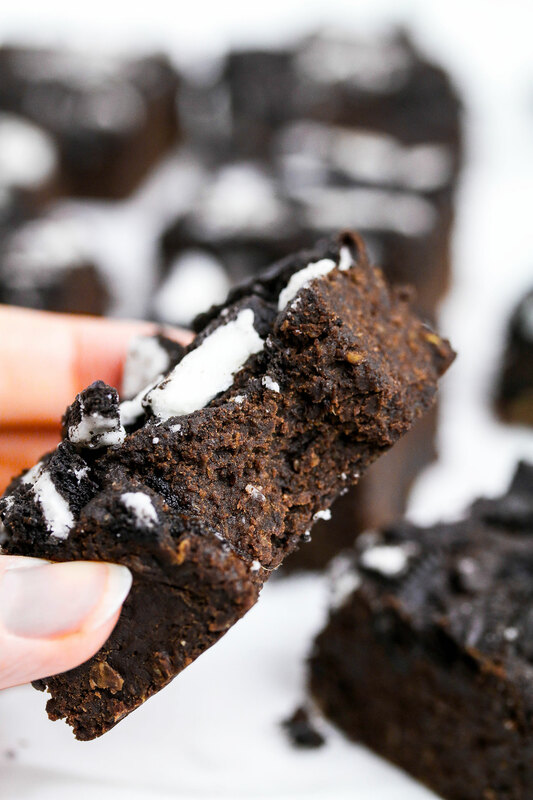 It’s almost my birthday, aka National Brownie Day! 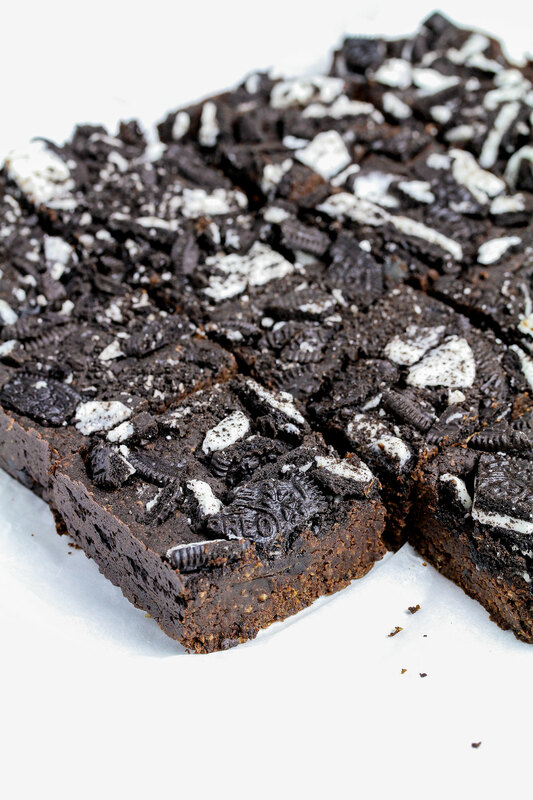 Hence, I definitely have to make an amazing brownie recipe like this that time! 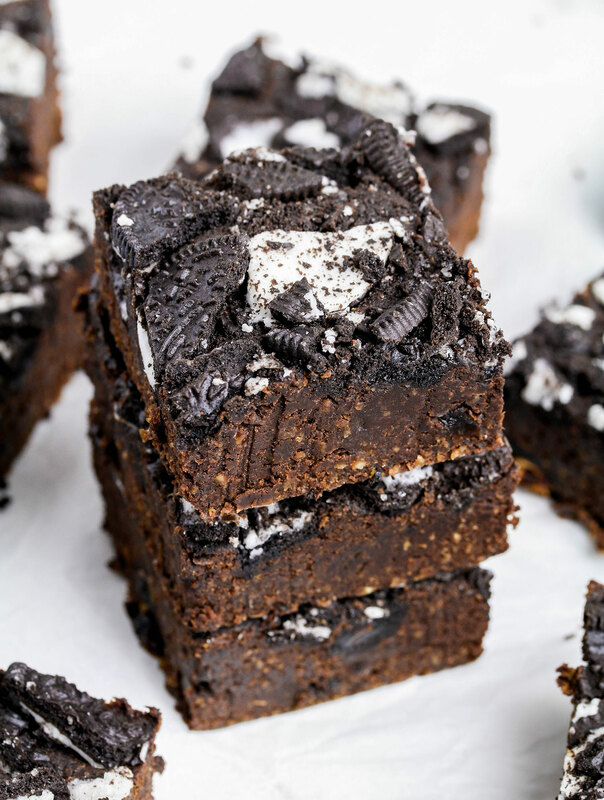 🙂 I definitely will be seeking out the ingredients for this batch very soon! How was the texture supposed to be? I made it today but mine was really soft and moist inside. Do you think i was supposed to bake it longer? It tasted really nice though. Thank you. The texture is supposed to be moist, like a gooey brownie. Did you make any changes to the ingredients/amounts? 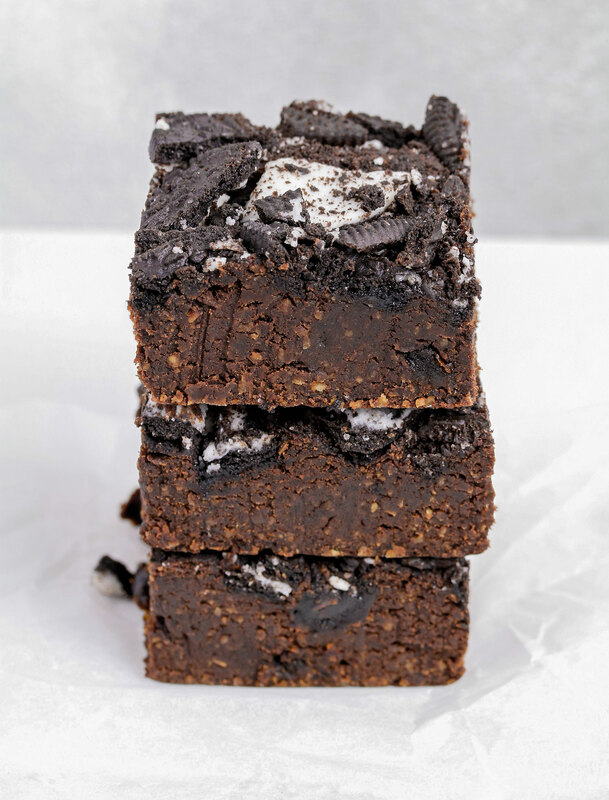 This is the epitome of balance 🙂 Adding chickpeas to brownies and finishing them off with Oreos – this is my kind of comfort food! Love the photography too – you really captured the decadence of this dish! When I made this the texture is soft and palpable like date balls – is it supposed to be more cake-like? Tastes so delicious regardless! 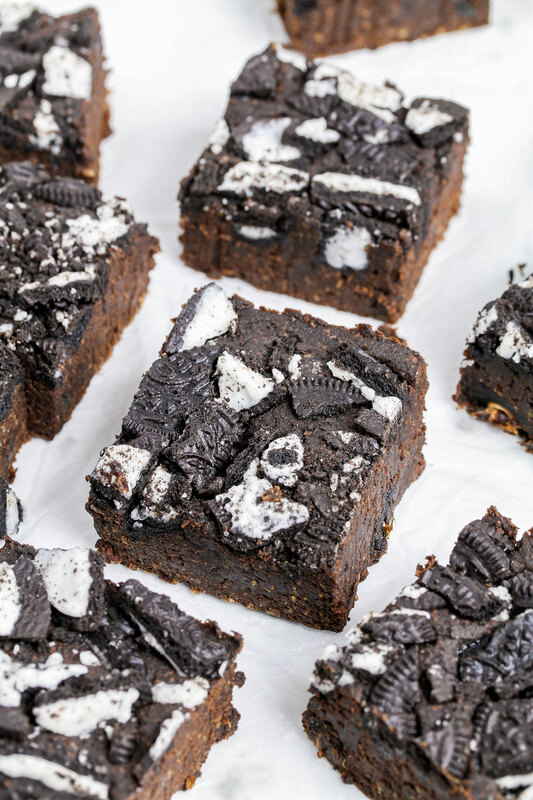 Oh my dear, these brownies are the best I have ever had! So soft and gooey and they taste like date-chocolate-heaven! I made them for christmas for a big family party and they were gone in a few minutes. Now everybody wishes me to make them for their birthday! Did you ever try to freeze them after baking?